Assuming that exponentially growing technology is an inevitable factor in the current era, it is imperative that organizations develop a structure and a matching culture in which accelerated change is embedded in the organization. This places special demands on an organization’s corporate environment and strategy, in which room for experiment, pioneering and innovation are common daily practice. Too often, these conditions are absent from large and bureaucratic organizations. Institutions will try to preserve the problem to which they are the solution. However, the first outlines of this new type of organization are looming on the horizon. 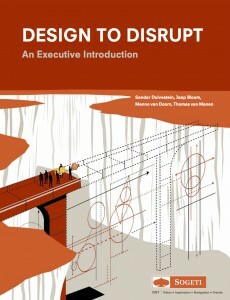 The 6 points below are a summary of the design principles that are imperative to effectuate disruptive innovation. 1. Exponential growth of technology. The consequent disruptive innovations put pressure on existing companies. Owing to the constantly changing (business) environment, companies have to constantly change and adapt (Continuous Design). 2. It is imperative that a corporate culture is created in which innovation is embraced, instead of confronted with feelings of distrust or resistance. Innovation must become the major process within a company. 3. Trust made scalable by technology. From centrally controlled organizations we are increasingly moving towards decentralized, distributed platforms. Existing companies must be unbundled. The physical world will be organized and structuralized in substantially different ways from those to which we are accustomed, thanks to the deployment of digital technology. As a direct result, IT and business will merge seamlessly into one another. 4. Platform economy players such as Airbnb and oDesk show us a world in which transparency is the new norm, and where, as a consequence, everyone can assess one another. It is no longer about ownership/possession/control of products, but about having access to / controlling all kinds of services. This requires and opens up all kinds of possibilities for new working methods. Reputation becomes the new currency. 5. Information technology democratizes. Now, the consumer possesses the tools to optimize his experience. The customer is the radiant central point, the linchpin around which the new economic systems revolve. More than ever, the customer is king. 6. The anxious customer obsession from the past has made way for a wave of new opportunities. Thanks to SMACT, it is now possible to create surprising customer experiences at all conceivable mobile-contact moments. After the initial transformation of atoms into bits, they now materialize once again in the actuality of our physical world. With a further thrust of bits into atoms, the circle of service to the customer will be closed with a focus on Mobile Moments to accommodate every need and wish.